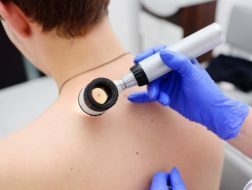 If you’re at a higher than normal risk for skin cancer, you may be following safe sun habits like regular skin checkups, avoiding tanning beds, applying sunscreen, hats, sunglasses, the whole shebang. Yet, there is one more thing that you can do to try and keep skin cancer at bay – and that is eating healthy. The main cause of skin cancer is the harmful ultraviolet rays of the sun; it is also found in tanning machines and some artificial lights. UV exposure releases free radicals, that cause inflammation, damage cells and the DNA of your skin – eventually leading to skin cancer. Antioxidants, which are present in food, can fight these free radicals and neutralize them. It is believed that UV exposure depletes antioxidants in our body, making it easy for free radicals to cause havoc. Therefore, it’s a no-brainer that you need to replace the antioxidants to fight the free radicals – and the best way to do that is by eating the right foods. However please keep in mind that it is not a 100% guarantee against skin cancer – often genetics play a part. But you can certainly improve your chances of prevention with diet and skin protection. 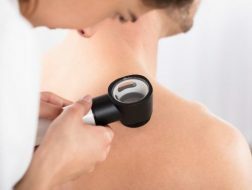 What Nutrients Can Help in Keeping Skin Cancer at Bay? It converts to vitamin A in the body; foods rich in beta carotenes give your immunity a boost, and may help decrease risk of certain cancers. You can get it from oranges, carrots, squash, sweet potato, cantaloupe, apricots, and mangoes. Lycopene contains a red pigment that protects tomatoes from sun damage, and may also help humans in the same way. Tomatoes, guavas, papayas, watermelon, apricots, pink grapefruit, blood oranges etc. contain lycopene. This particular nutrient inhibits a chemical called COX 2 which helps skin cancer cells to multiply fast. Omega-3 fatty acids also aid in reducing inflammation. Studies have shown that there is a strong link between inflammation and cancer. Salmon, mackerel, sardines, herring, tuna and other fatty fish are rich in omega-3s. For vegetarians, walnuts and flax seeds are good sources. Both green and black tea contain polyphenols, but green tea is considered even better. Those polyphenols contain potent anti-inflammatory, antioxidant, and anti-tumor properties. It has been seen that they are able to repair skin damage caused by UV exposure. Lab studies have shown that green tea has helped prevent UV triggered skin cancer by consuming free radicals and mitigating the UV damage. This mineral boosts immunity, and helps the body to fight diseases including cancer; it also helps activate antioxidants present in the body. Eating foods rich in zinc can help increase the level of proteins responsible for repairing DNA, reducing the damage caused to the skin. Chickpeas, black beans, kidney beans, lentils, shellfish, lamb and beef are rich in zinc. Selenium may help reduce your risk of any type of cancer by up to 31%, and 40% lower risk of death. Brazil nuts, chicken, and grass fed beef are good sources of this mineral. High levels of vitamin C may help lower the risk of death from cancer. Vitamin C is vital for cell repair. All citric fruits like oranges, lemon, limes, berries, bell peppers, broccoli, leafy greens – all contain this vitamin. It is proven that this vitamin is crucial for healthy bones and provides support to the immune system; now it is also proven that it reduces risk of melanoma, breast, colon and rectal cancer. The skin does produce Vitamin D when you’re exposed to the sun; but when that exposure is not protected, it can get depleted and cause skin damage. Fatty fish like those mentioned before, cod liver oil, eggs, beef liver, milk, and dairy products contain vitamin D; you can also take vitamin supplements. Vitamin E has many benefits for the skin – it helps keep skin elastic and healthy; it also has powerful anti-inflammatory effects, and fortifies the skin and veins, facilitating their function as protective barriers. Nuts like almonds, hazel nuts, peanuts, seeds like sunflower, wheat germ soybean, spinach and so on are rich sources of vitamin E.
Do follow us on Facebook, Twitter, Pinterest, and LinkedIn for more health news and tips. If you’d like to consult our physician for a skin checkup, schedule your appointment now.